This fall, invite your kids to create special Wikki Stix harvest crafts! The time spent together will make lasting autumn memories while constructing great crafts to display or to give as gifts! 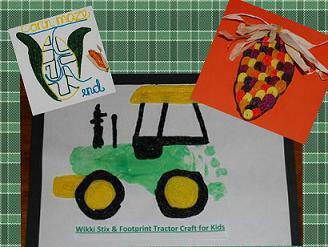 Materials needed: Green Washable Tempera Paint, White Paper, a Paper Plate or Paint Tray, Paper Towels, and Black/Yellow Wikki Stix (IH tractor fans can always make the tractor craft in red/white). Pour the green tempera paint onto a paper plate or a paint tray. The children can apply green paint to their foot with a paper towel (it works much better than brushing the paint on or having the kids step into the paint tray). Lay a piece of white paper on the floor and have the children step on the paper to make a footprint. *Note: if making the craft for a gift, use scrapbook paper or heavy linen paper for the footprint. 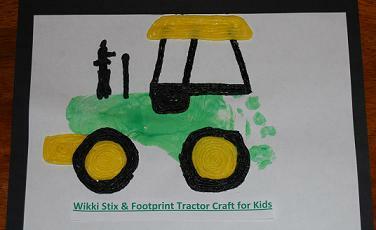 Allow the footprints to dry thoroughlybefore adding the Wikki Stix to make the tractor. Tractor Wheels: The wheels are formed from yellow Wikki Stix wrapped around to form two yellow spirals (one yellow spiral should be slightly larger than the first). Add black Wikki Stix around the yellow spirals to resemble the tractor tires. Place both of the tractor wheels on the dried footprint as shown in the photo above. Tractor Cab: Use two strands of black Wikki Stix to form the outline of the tractor’s cab. Yellow Wikki Stix can be used to make the roof of the cab (or red/white for IH fans). The children can add other features (as shown in photo above) if desired. We had this craft mounted, framed, and signed by our youngest son for my grandfather’s birthday many years ago. He has since passed, but it was one of his most cherished gifts. Materials needed: Assorted Fall Colors of Wikki Stix (purple, brown, green, yellow, orange, red, etc. ), Scissors, Mounting Paper, and Corn Husks or Natural Raffia. Make a tray with assorted fall colors of Wikki Stix (single strands of Wikki Stix should be cut in half prior to the craft). Give the children one sheet of fall colored paper and have them use yellow or brown Wikki Stix to form the oval outline for the corn. The individual kernels of corn are made with ½ strands of Wikki Stix wrapped around to form small spirals. The children can work on patterning skills while using the different colors of Wikki Stix to form the individual kernels (see photo above). If desired, use corn husks or natural raffia to finish the craft. 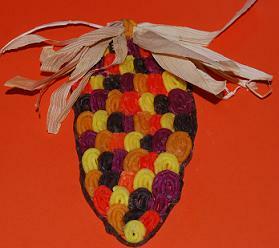 The husks or raffia pieces can be attached to the Indian Corn Craft with Wikki Stix. Materials needed: White Paper, Scissors, and Yellow/Green Wikki Stix. Creating the corn maze is not only a fun craft, but one that will employ critical thinking skills as kids work to design the patterns. 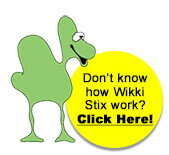 The children can make a corn outline from the yellow/green Wikki Stix (see photo above). outline for an “exit” (see photo). 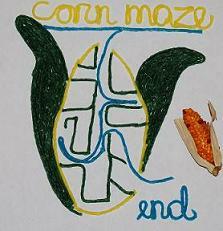 Tell the children that they must design a maze within the corn outline. The maze must start at the top opening and exit at the bottom. When the corn maze craft is finished, the children can exchange the craft with an adult, sibling, or peer. Others must then work, using Wikki Stix, to find the way through the maze to the exit. The maze designs can be changed as often as the children like. It is a great “thinking” activity that kids like to create and play! If you make other fall crafts using Wikki Stix, we’d love to hear about them! Leave us a comment below to let us know how you create and play with Wikki Stix!